Back to the booze pop story. When I think tequila, I automatically think margarita. How festive in a Popsicle! Sadly, I do not have margarita mix either. Yep, I’m still to lazy to run to the store to buy some. I should mention there are five grocery stores in a four mile radious of my house. But yeah, running to the store requires finding car keys and my wallet. I rarely leave with just the item on my list either. I'm a foodie and am tempted to buy interesting ingredients all. the. time. It's best for me to use what I have. Especially when I'm trying to rebuild our household emergency fund. Besides, I’m in the mood for something sweet, not tart like a traditional margarita. Since there has to be a significant amount of juice in the mix and a kiss of Jose Cuervo Espeical or it will not freeze into a Popsicle I used what I had on hand and went retro. I made tequila sunrise Popsicles! I bought a set of Prepara Volcano BPA free Popsicle molds earlier in the summer to make Popsicles. I think it's easier to get the finished product out of individual Popsicle molds than my other set of Popsicle molds that are in a row like an ice cube tray. The Prepara Volcano Popsicle molds allow me to color code the Popsicles so I know which ones are for grown ups only. 1. Mix the orange juice, grenadine, and Jose Cuervo Especial tequila together. 2. 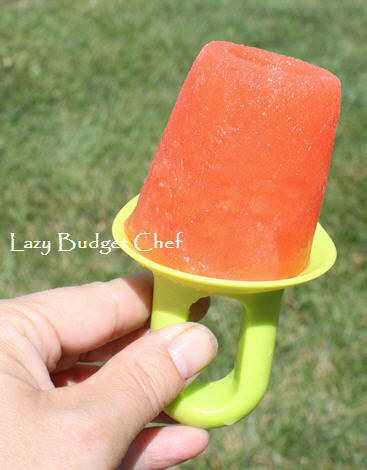 Pour the tequila sunrise mixture into a Popsicle mold. 3. Put the Popsicle molds in the freezer and wait and wait and wait until the tequila sunrise Popsicles freeze. My friends hailed me a bartending goddess. That means you should probably make them too. Disclosure: I am a Balancing Act Community Blogger. I received a sample of Jose Cuervo Espeical to facilitate recipe development. Please use this product responsibly. Now this is the summertime treat that I am talking about! The grown up dessert. Hi, is this 1 cup or 1/2 cup of grenadine? Rose and I love our wine, but this sounds wonderful! Next on our list for a craft night, Popsicles and crafts! We would love for you to share this at our link party, Crafty Lassie Tuesday. It ends tonight at 5pm. I totally pinned this. What a great idea! Yum I love tequilla sunrises. This would make a perfect popsicle.